NATIONAL TRUST president wrote a new book. Hello, again! It’s been a little over a decade since this column was last published, and I was thrilled to be asked to share my thoughts on preservation with you. Time has marched on, but the cause of preserving our neighborhoods and landmarks is still a relevant topic throughout Los Angeles today. Larchmont Chronicle publisher John Welborne and I have had many discussions on the subject over the years, many of them in the context of our participation in the activities of the National Trust for Historic Preservation, where he served a valued role as a Trustee and I still participate on the Board of Advisors. The Trust, as most of you are aware, is the national organization founded 68 years ago to ensure that America’s landmarks are preserved and protected. With a presence in all 50 states and successful partnerships with statewide and local organizations, the Trust continues to identify issues of concern that play out across the country. Helping to decide which parts of the built environment we want to survive into the next century has been the Trust’s mission; devising tools to preserve is a primary goal. The president of the Trust, Stephanie Meeks, has just written a book that explores the roots of the preservation movement and the challenges it faces in the 21st century. Titled “Past and Future City: How Historic Preservation is Reviving America’s Communities,” the book devotes its introductory pages to the concept of the “power of place.” Meeks, who believes that the constituency for preservation far exceeds the card-carrying members of the Trust, asks a series of questions which she states are important to the everyday lives of community residents from East Coast to West Coast and in between. Places have “power” in individual lives when they embody stories and memories. Historical places ground us: they define a community that we can share with our neighbors today, keep for future generations and let us feel a connection to those who came before. In the past decade, scientists have studied the “power of place,” and the Trust now uses these data in formulating its approaches to saving places. Scientist Maria Lewicke calls it “place attachment,” stating that the “development of emotional bonds with places is a prerequisite of psychological balance and good adjustment…. It helps to overcome identity crises and gives people a sense of stability in a changing world.” If she’s right, preservation of special places can influence our health and well-being. Shouldn’t we want to invest in that? Some statistics from the Meeks book’s introduction: Eighty percent of Americans now live in cities and urban areas, and there is immense pressure to grow. The urban population of the country grew 12 percent between 2000 and 2010. In finding room for all the newcomers, is there a place for older buildings? Meeks maintains there is — that distinguished repurposed landmarks and traditional neighborhoods provide that authenticity that residents cherish and that make tourism an important factor in the national economy. Meeks cites a 2014 study by architecture and planning firm Sasaki Associates that asked residents of Austin, New York City, Boston, Chicago, San Francisco and Washington, D.C. to define what they loved about heir cities. Over 60 percent liked looking at historic buildings more than contemporary ones and thought it important to renovate existing buildings to retain character while making them more usable. Other studies found that over 80 percent of respondents felt historic buildings should be treated as community assets. Do these analyses confirm a new interest in preservation in the 21st century? 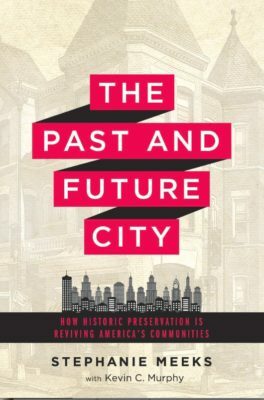 Will the preservation movement be able to respond to the challenges ahead with new and diverse solutions to manage change while ensuring a continuum between the past and the future? Meeks is optimistic that historic preservation will address the needs of the community, both economically and socially, with new tools and new partnerships using research and technology. A lot of food for thought as we enter 2017 in Los Angeles and recommit ourselves to the preservation of our historic landmarks and neighborhoods. The Meeks book is available at local booksellers and at: islandpress.org/book/the-past-and-future-city. All royalties will be donated to the National Trust for Historic Preservation. Christy Johnson McAvoy, a former president of both the Los Angeles Conservancy and the California Preservation Foundation, founded Historic Resources Group (HRG) in Hollywood in 1989. Now located in Pasadena, HRG is a recognized leader in providing historic preservation planning, architectural consultation and development services.